It has been 3 years since I started this blog but I don’t know why I haven’t blogged about something as basic as eggless pancakes until today. My husband and I are not big pancake fans. I do prepare it once in a month or two for my son. Initially, I used to buy Bisquick; add some mashed bananas or applesauce for the eggs and add the extra baking powder to make egg free pancakes. Then I tried a couple of right-from-scratch recipes minus the eggs and wasn’t very pleased with the results. At that time I was not able to find a decent pancake recipe without eggs. Later I found a wholegrain pancake mix from Bulk Barn, to which I had to just add water and viola eggless pancakes were ready. Those living in Canada can find this mix in Bulk Barn. The mix is egg free. Last morning my husband asked me to prepare egg free pancakes for breakfast because we don’t have that on the blog. So making it would serve two purposes. I landed on this homemade pancakes without eggs recipe and after reading the raving reviews I had to try it. The verdict is: "these are the best eggless pancakes you will ever taste". To tell the truth, I haven’t actually tasted a regular pancake with eggs (yes after 8 years in North America, I haven’t tasted it even once) so I cannot compare it with that, but I’m pretty sure that these pancakes are as good as the usual ones. A couple of reviewers have tried this recipe because they ran out of eggs and they are all praises for it, which means that these pancakes are definitely good. So if you have run out of eggs are do not want to use eggs and are wondering how to make pancakes without eggs, here's the only recipe you have to try. 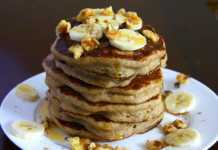 I also have a vegan pancake recipe, the vegan version of the best eggless pancakes recipe. Do try it! 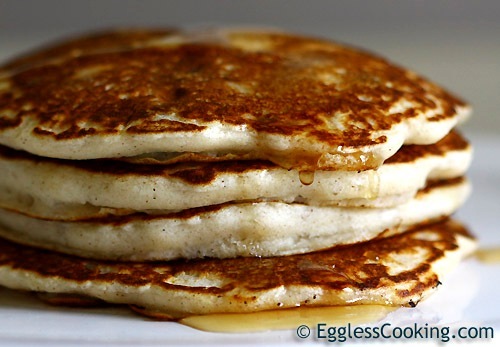 If you want to make eggless pancakes for some reason or the other, this is the only recipe you should be trying. Don't waste time searching for recipes and going through each one of it. I have said it earlier and I'm going to say it again, these are THE best eggless pancakes. Light, soft and fluffy! You have to have some syrup or something to sweeten it because its not sweet by itself. But I guess that's how pancakes are supposed to be. The pan should not be over-heated or else the pancakes will blacken. To get that nice golden color I usually have the knob at 4. I added a couple of blueberries to the batter. You can add about 1/2 a cup of nuts, fruits or chocolate chips for this measurement. Thanks for sharing your recipe ! My family loved it. I didn’t have any eggs (a staple in our family), but because of you, we found our new favorite weekend breakfast! We added chopped pecans to the mix and it was fantastic! Thanks again! We made these this morning because we were out of eggs and the temperature outside in our part of Illinois is minus 24 degrees, and we didn’t wish to go out. 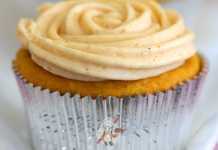 These are wonderful and delicious, and on one go have earned a place in our recipe cabinet. Thank you so much. Thank you very much for trying the recipe, Eric. Hi, these are delicious! Just wondering if they’re ok to freeze once made? I have not tried freezing the pancakes, Sarah, but I don’t see why it shouldn’t work. I freeze waffles all the time and it works very well. Yep these were amazing. Used whole wheat flour and subbed milk for almond milk. You’re very welcome, Julie and thank you very much for the feedback. I was REALLY low on ingredients and found this recipe – as I was making it I realized I was also out of butter! Subbed in olive oil and it was still delicious! Also added blueberries – SO good. Great recipe to have! THANKS! You’re very welcome, Richardson. Thank you very much for trying the recipe. Yum!!! I doubled the recipe, exchanged 1 cup of flour with 1/2 cup almond flour & 1/2 a cup whole wheat flour and added a banana… super tasty, thanks! Wow! Barb! Almond flour works too!? I will have to try that now. Thanks for letting me know. Hubby wanted pancakes for breakfast but egg recipes don’t agree with him. I found and tried your recipe this morning. He LOVED them. Thanks!!! You’re very welcome, Kathy A. You saved the day! No eggs & hungry skiers to feed….this was a great way to go. I snuck in a couple tablespoons of milk powder in addition to the measured liquid milk to increase the protein content a bit, otherwise followed instructions to the letter and they turned out beautifully. Thank you for sharing your recipe! You’re welcome, Tracy. Thank you very much for leaving a feedback. Thank you so much for taking the time to come up with this yummy and easy recipe. My egg allergy daughter loves these and my son enjoys them as well. Super fluffy and easy! Thank you very much, Erin, although I can’t take the full credit for the recipe. I tried it from another website. I’m glad to know that your son is enjoying these pancakes. It did not work at all. There seems to be nothing binding the pancakes and they just stuck to the pan and crumbled when you try to flip them. So sad as we were really looking forward to these for dinner. There will have to be quite some experimentation and tweeking to get this to work well it seems. Sorry to hear about your experience, Jacques. Hope you got to see the other reviews and how well it turned out for them. I’m unable to guess where it could have gone wrong for you. it was horrible. learn from my mistakes. Wow! 1 cup of heavy cream is too much indeed. The recipe would have perfectly worked if it was just milk. Hope you will try it again. Amazing and my kids loved them. I have finally found the one! Made these this morning SO DELICIOUS!!!!!!! Love the smell of cinnamon and the taste in my pancakes. I am not a fan of vanilla extract. I used maple syrup. Will continue to keep making this. Thank you so much for sharing! Hey the recipe is perfect…. my kids loved it!!! Thanks a lot….!!! Amazingly fluffy delicious pancakes. The addition on cinnamon made them extra special. Made them originally beauce we had run out of eggs but they have now become our go to recipe. A big hit with the family. Slight variation to the recipe as I had no plain flour only SR flour so I halved the baking powder component and they turned out magic! Thank you very much, Sarah. May I please ask what is SR flour? Hi should v put butter in base of the pan. If it’s a non-stick pan it’s really not necessary, but doing it is also fine. Thank you very much for trying the recipe and for your feedback, Masyam. This turned out really good. My son pulled out the pancake pan and asked me to make pancakes but I was out of mix, so I looked this one up. They love it and so do i. Thank you very much for trying the recipe, Candice. I have never cared much for pancakes, until now! I made this recipe for my egg allergic daughter and the pancakes are amazing!! Light, fluffy, great taste, big hit with my family. We have also made them with blueberries and with Enjoy Life brand chocolate chips – both amazing! I honestly think this recipe is better than a traditional recipe with egg included. This will become a staple in my family – thank you! You’re very welcome, Jill. I’m glad that your family likes it. Just made it. It is a great recipe. I’ve added choc chips and coconut flakes. It was perfect. Thank you for sharing this recipe. Wow, I make a lot of pancakes for my son and all the little neighborhood kids..( you know how picky some kids are, then add the egg allergy too the mix) These are the best, seriously! I don’t even care for pancakes but I love em! I’ve made PC’s with yogurt, bananas mashed in, a dozen different recipes, just to try something new and different. Hands down the best and most delicious! Guess I’m a PC lover now, Thanks for sharing! Made em with cherries and a few choc chips … decadent! Thank you very much, Michelle. First thing in the morning I’m reading today. What a great way to start the day! Delicious! 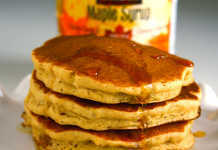 We’ve lived with egg free recipes for 10 years because of my sons allergies – this is for sure the best pancake recipe. Not too complicated but enough depth to taste like a darn good pancake. Thank you! These were good, didn’t really brown properly but the flavor was good and they were fluffy enough. This recipe isn’t for 6 servings though. I made the recipe, come out with 5 four inch pancakes, and served it to two people. I’m not sure all the fat is necessary, next time I’ll omit or reduce the oil and reduce the butter to make this recipe not so high calorie.